Penguins (order Sphenisciformes, family Spheniscidae) are a group of aquatic, flightless birds living almost exclusively in the southern hemisphere , especially in Antarctica . Highly adapted for life in the water, penguins have countershaded dark and white plumage, and their wings have become flippers. Most penguins feed on krill, fish, squid, and other forms of sealife caught while swimming underwater. They spend about half of their life on land and half in the oceans. The largest living species is the Emperor Penguin (Aptenodytes forsteri): adults average about 1.1 m (3 ft 7 in) tall and weigh 35 kg (75 lb) or more. The smallest penguin species is the Little Blue Penguin (Eudyptula minor), also known as the Fairy Penguin, which stands around 40 cm tall (16 in) and weighs 1 kg (2.2 lb). 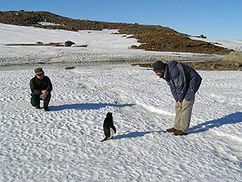 Among extant penguins, larger penguins inhabit colder regions, while smaller penguins are generally found in temperate or even tropical climates (see also Bergmann's Rule). Some prehistoric species attained enormous sizes, becoming as tall or as heavy as an adult human (see below for more). These were not restricted to Antarctic regions; on the contrary, subantarctic regions harboured high diversity, and at least one giant penguin occurred in a region not quite 2,000 km south of the equator 35 mya, in a climate decidedly warmer than today. Penguin may come from the Latin pinguis, “fat”. This is supported by the fact that the corresponding words in most other languages (e.g., French pingouin, German Pinguin) have i instead of e as the first vowel. What may be a King Penguin but certainly is a member of the Spheniscidae appears on a 1599 map at the Strait of Magellan with the caption "Pinguyn". The map's features are labeled in Latin, such as Fretum Magellanicum ("Strait of Magellan"). In addition, there is ample evidence that the Latin term anser magellanicus ("Goose of Magellan" or "Magellanic Goose") was the usual term for penguins in the scholarly literature of that time. As a side note, the French pingouin actually translates to English as the Auk, as penguins are called manchot in French. The word Penguin is thought by some to derive from the Welsh words pen (head) and gwyn (white), applied to the Great Auk which had white spots in front of its eyes (although its head was black); or from an island off Newfoundland known as Pengwyn, due to its having a large white rock. (In the latter case, the name may also have come from Breton.) This fanciful theory is highly unlikely, since penguins do not actually have white heads, and there are no other examples of a Welsh word becoming the basis of words throughout Europe languages. Welsh was not even spoken in England, let alone throughout Europe. Furthermore penguins have no particular link to the Welsh which would lead foreigners loan a word from Welsh. A Welsh i is often sound-shifted to an e in the English language. In a final twist to the story, the term "Magellanic Goose" (today usually "Magellan Goose") in our time has come to denote an actual anseriform, namely a Chloephaga sheldgoose. Some recent sources apply the phylogenetic taxon to what here is referred to as Spheniscinae. Furthermore, they restrict the phylogenetic taxon Sphenisciformes to flightless taxa, and establish the phylogenetic taxon as equivalent to the Linnean taxon Sphenisciformes, i.e., including any flying basal "proto-penguins" to be discovered eventually. Given that neither the relationships of the penguin subfamilies to each other nor the placement of the penguins in the avian phylogeny is presently resolved, this seems spurious and in any case is confusing; the established Linnean system is thus followed here. The basal penguins lived around the time of the Cretaceous–Tertiary extinction event somewhere in the general area of (southern) New Zealand and Byrd Land, Antarctica. Due to plate tectonics, these areas were at that time less than apart rather than the of today. The most recent common ancestor of penguins and their sister clade can be roughly dated to the Campanian–Maastrichtian boundary, around 70–68 mya.What can be said as certainly as possible in the absence of direct (i.e., fossil) evidence is that by the end of the Cretaceous, the penguin lineage must have been evolutionarily well distinct, though much less so morphologically; it is fairly likely that they were not yet entirely flightless at that time, as flightless birds have generally low resilience to the breakdown of trophic webs which follows the initial phase of mass extinctions because of their below-average dispersal capabilities (see also Flightless Cormorant). The oldest known fossil penguin species is Waimanu manneringi, which lived in the early Paleocene epoch of New Zealand , or about 62 mya. While they were not as well-adapted to aquatic life as modern penguins, Waimanu were generally loon-like birds but already flightless, with short wings adapted for deep diving. They swam on the surface using mainly their feet, but the wings were – as opposed to most other diving birds, living and extinct – already adapting to underwater locomotion. Perudyptes from northern Peru was dated to 42 mya. An unnamed fossil from Argentina proves that by the Bartonian (Middle Eocene), some 39–38 mya,primitive penguins had spread to South America and were in the process of expanding into Atlantic waters. During the Late Eocene and the Early Oligocene (40–30 mya), some lineages of gigantic penguins existed. Nordenskjoeld's Giant Penguin was the tallest, growing nearly 1.80 meters (6 ft) tall. The New Zealand Giant Penguin was probably the heaviest, weighing 80 kg or more. Both were found on New Zealand , the former also in the Antarctic farther eastwards. Traditionally, most extinct species of penguins, giant or small, had been placed in the paraphyletic subfamily called Palaeeudyptinae. More recently, with new taxa being discovered and placed in the phylogeny if possible, it is becoming accepted that there were at least two major extinct lineages. One or two closely related ones occurred in Patagonia, and at least one other – which is or includes the paleeudyptines as recognized today – occurred on most Antarctic and subantarctic coasts. But size plasticity seems to have been great at this initial stage of penguin radiation: on Seymour Island, Antarctica, for example, around 10 known species of penguins ranging in size from medium to huge apparently coexisted some 35 mya during the Priabonian (Late Eocene). It is not even known whether the gigantic palaeeudyptines constitute a monophyletic lineage, or whether gigantism was evolved independently in a much restricted Palaeeudyptinae and the Anthropornithinae – whether they were considered valid, or whether there was a wide size range present in the Palaeeudyptinae as delimited as usually done these days (i.e., including Anthropornis nordenskjoeldi). The oldest well-described giant penguin, the 5-foot-tall Icadyptes salasi, actually occurred as far north as northern Peru about 36 mya. In any case, the gigantic penguins had disappeared by the end of the Paleogene, around 25 mya. Their decline and disappearance coincided with the spread of the Squalodontoidea and other primitive, fish-eating toothed whales, which certainly competed with them for food, and were ultimately more successful. A new lineage, the Paraptenodytes which includes smaller but decidedly stout-legged forms, had already arisen in southernmost South America by that time. The early Neogene saw the emergence of yet another morphotype in the same area, the similarly-sized but more gracile Palaeospheniscinae, as well as the radiation which gave rise to the penguin biodiversity of our time. Modern penguins consititute two undisputed clades and another two more basal genera with more ambiguous relationships. The origin of the Spheniscinae lies probably in the latest Paleogene, and geographically it must have been much the same as the general area in which the order evolved: the oceans between the Australia-New Zealand region and the Antarctic. Presumedly diverging from other penguins around 40 mya, it seems that the Spheniscinae were for quite some time limited to their ancestral area, as the well-researched deposits of the Antarctic Peninsula and Patagonia have not yielded Paleogene fossils of the subfamily. Also, the earliest spheniscine lineages are those with the most southern distribution. Pygoscelis contains species with a fairly simple black-and-white head pattern; their distribution is intermediate, centered on Antarctic coasts but extending somewhat northwards from there. In external morphology, these apparently still resemble the common ancestor of the Spheniscinae, as Aptenodytes' autapomorphies are in most cases fairly pronounced adaptation related to that genus' extreme habitat conditions. As the former genus, Pygoscelis seems to have diverged during the Bartonian,but the range expansion and radiation which led to the present-day diversity probably did not occur until much later; around the Burdigalian stage of the Early Miocene, roughly 20–15 mya. The geographical and temporal pattern or spheniscine evolution corresponds closely to two episodes of global cooling documented in the paleoclimatic record. The emergence of the subantarctic lineage at the end of the Bartonian corresponds with the onset of the slow period of cooling that eventually led to the ice ages some 35 million years later. With habitat on the Antarctic coasts declining, by the Priabonian more hospitable conditions for most penguins existed in the subantarctic regions rather than in Antarctica itself. Notably, the cold Antarctic Circumpolar Current also started as a continuous circumpolar flow only around 30 mya, on the one hand forcing the Antarctic cooling, and on the other facilitating the eastward expansion of Spheniscus to South America and eventually beyond. Despite this, there is no fossil evidence to support the idea a crown radiation from the antarctic continent in the Paleogene . What seems clear is that penguins belong to a clade of Neoaves (living birds except paleognaths and fowl) which comprises what is sometimes called "higher waterbirds" to distinguish them from the more ancient waterfowl. This group contains such birds as storks, rail, and the seabirds, with the possible exception of the Charadriiformes. Penguins are superbly adapted to an aquatic life. Their vestigial wings have become flippers, useless for flight in the air. In the water, however, penguins are astonishingly agile. Within the smooth plumage a layer of air is preserved, ensuring buoyancy. The air layer also helps insulate the birds in cold waters.On land, penguins use their tails and wings to maintain balance for their upright stance. All penguins are countershaded for camouflage – that is, they have a white underside and a dark (mostly black) upperside. A predator looking up from below (such as an orca or a leopard seal) has difficulty distinguishing between a white penguin belly and the reflective water surface. The dark plumage on their backs camouflages them from above. Diving penguins reach 6 to 12 km/h (3.7 to 7.5 mph), though there are reports of velocities of 27 km/h (17 mph) (which are more realistic in the case of startled flight). The small penguins do not usually dive deep; they catch their prey near the surface in dives that normally last only one or two minutes. Larger penguins can dive deep in case of need. Dives of the large Emperor Penguin have been recorded which reach a depth of 565 m (1,870 ft) and last up to 22 minutes. Penguins have a thick layer of insulating feathers which serve to keep them warm in water (heat loss in water is much greater than in air). The Emperor penguin (the largest penguin) has the largest body mass of all penguins, which further reduces relative surface area and heat loss. They also are able to control blood flow to their extremities, reducing the amount of blood which gets cold, but still keeping the extremities from freezing. In the extreme cold of the Antarctic winter, the females are at sea fishing for food leaving the males to brave the weather by themselves. They often huddle together to keep warm and rotate positions to make sure that each penguin gets a turn in the center of the heat pack. The Auk of the Northern Hemisphere is superficially similar to penguins: they are not related to the penguins at all, but considered by some to be a product of moderate convergent evolution. Perhaps one in 50,000 penguins (of most species) are born with brown rather than black plumage. These are called isabelline penguins, possibly in reference to the legend that the archduchess Isabella of Austria vowed not to change her undergarments until her husband united the northern and southern Low Countries by taking the city of Ostend – which took three years to accomplish. Isabellinism is different from albinism. Isabelline penguins tend to live shorter lives than normal penguins, as they are not well-camouflaged against the deep, and are often passed over as mates. Although all penguin species are native to the southern hemisphere, they are not found only in cold climates, such as Antarctica . In fact, only a few species of penguin actually live so far south. At least 10 species live in the temperate zone; one, the Galápagos Penguin, lives as far north as the Galápagos Islands , but this is only made possible by the cold, rich waters of the Antarctic Humboldt Current which flows around these islands. Major populations of penguins are found in:Antarctica , Australia, New Zealand , South America, and South Africa. Penguins for the most part breed in large colonies, the exceptions being the Yellow-eyed and Fiordland species; these colonies may range in size from as few as a 100 pairs for Gentoo Penguins, to several hundred thousand in the case of King, Macaroni and Chinstrap Penguins. Living in colonies results in a high level of social interaction between birds, which has led to a large repertoire of visual as well as vocal displays in all penguin species. Agonistic displays are those which are intended to confront or drive off, or alternately appease and avoid conflict with, other individuals. Penguins form monogamous pairs for a breeding season, though the rate the same pair recouples varies drastically. Most penguins lay two eggs in a clutch, although the two largest species, the Emperor and the King Penguins, lay only one. With the exception of the Emperor Penguin, in all penguins share the incubation duties. These incubation shifts can last days and even weeks as one member of the pair feeds at sea. Penguins generally only lay one brood; the exception is the Little Penguin which can raise two or three broods in a season. Penguin eggs are smaller than any other bird species when compared proportionally to the weight of the parent birds; at , the Little Penguin egg is 4.7% of its mothers' weight, and the Emperor Penguin egg is 2.3%. The relatively thick shell forms between 10 and 16 % of the weight of a penguin egg, presumably to minimise risk of breakage in an adverse nesting environment. The yolk, too, is large, and comprises 22–31 % of the egg. Some yolk often remains when a chick is born, and is thought to help sustain it if parents are delayed in returning with food. When mothers lose a chick, they sometimes attempt to "steal" another mother's chick, usually unsuccessfully as other females in the vicinity assist the defending mother in keeping her chick. In some species, such as Emperor Penguins, young penguins assemble in large groups called crèche. Penguins seem to have no special fear of humans, and have approached groups of explorers without hesitation. This is probably because penguins have no land predators in Antarctica or the nearby offshore islands. Instead, penguins are at risk at sea from predators such as the leopard seal. Typically, penguins do not approach closer than about 3 meters (10 ft) at which point they become nervous. This is also the distance that Antarctic tourists are told to keep from penguins (tourists are not supposed to approach closer than 3 meters, but are not expected to withdraw if the penguins come closer). Penguins are popular around the world, primarily for their unusually upright, waddling gait and (compared to other birds) lack of fear of humans. Their striking black-and-white plumage is often likened to a tuxedo suit. Mistakenly, some artists and writers have penguins based at the North Pole . This is incorrect, as there are almost no wild penguins in the northern hemisphere , except the small group on the northernmost of the Galápagos . The cartoon series Chilly Willy helped perpetuate this myth, as the title penguin would interact with northern-hemisphere species such as polar bears and walruses. Penguins have been the subject of many books and films such as Happy Feet and Surf's Up, both CGI films; March of the Penguins, a documentary based on the migration process of the Emperor Penguin; and a parody entitled Farce of the Penguins. Penguins have also found their way into a number of cartoons and television dramas; perhaps the most notable of these is Pingu, created by Silvio Mazzola in 1986 and covering more than 100 short episodes. Penguins featured regularly in the cartoons of UK cartoonist Steve Bell in his strip in The Guardian Newspaper, particularly during and following the Falklands War. In the mid-2000s, penguins became one of the most publicized species of animals that form lasting homosexual couples. A children's book, And Tango Makes Three, was written about one such penguin family in the New York Zoo . Oxford English Dictionary. Accessed 2007-03-21. The exact divergence dates according to Baker et al. (2006) mentioned in this section are not as precisely resolved as it appears to be due to uncertainties of the molecular clock used. Contra Baker et al. (2006). In fact, it is fairly likely that during the Bartonian, there was a near-synchronous but allopatric split between the ancestors of Aptenodytes, Pygoscelis, and the common ancestor of all remaining genera [Baker et al. (2006)]. Piper, Ross (2007), Extraordinary Animals: An Encyclopedia of Curious and Unusual Animals, Greenwood Press.